Cucumber, scientific name Cucumis sativus, belongs to the Gourd family Cucurbitaceae. It is a creeping vine that produces edible fruits that are cylindrical in shape. There are three main variants of Cucumber: these being “burpless”, “pickling”, and “slicing”. Several different cultivars have emerged within these main cucumber varieties. The species originated in India but they are now planted and harvested world-wide. The cucumber plant produces huge leaves, which also serve as a canopy for the fruits. The Cucumber fruit is roughly cylindrical and elongated with tapered ends. It can grow up to 24 inches (60 cm) long and to four inches (10 cm) in diameter. Growing Cucumber Photograph by Joe Quick. Is The Cucumber a Fruit or Vegetable? Cucumbers are biologically classified as fruits due to the fact that they have enclosed seeds and develop from a flower. However, they are mostly prepared and eaten as a salad vegetable much like other fruits such as squash and tomatoes. It is worth noting that in botanical nomenclature there is no such term as 'vegetable' The term use is culinary, and therefore it is fine to call a cucumber both a fruit and a vegetable. Cucumber Fruit Photograph by Karen and Brad Emerson. Cucumber fruits are composed of approximately 90% water. Cucumbers can be eaten fresh and can also be pickled for storage purposes. The pickled cucumbers are referred to as the pickling variants, while those that are eaten fresh are called as the slicing variants. Eating cucumber can bring several health benefits as it is highly rich in nutrients that are essential for hair, skin and nail care. Cucumbers prefer sites that have a good amount of warmth and sunshine. Prepare garden beds a couple of weeks before sowing with well-rotted manure and compost. The soil should not be too acidic and should have a pH that is between 5.5 and 7.0. See to it that enough space is given for the plant to grow; cucumbers can rapidly grow to around six feet long. People with limited spaces can make use of a trellis or stake within the planting area. Cucumbers thrive in a sandy, well-drained, loamy soil. For locations that gets a lot of rain, or when the soil is too acidic for the plant, add lime as this can help in the acidity of the soil. Such process can prevent molybdenum deficiency, or causing the leaves to curl. Increased soil pH leads to increased molybdenum availability in the soil; alternatively give an application of sodium or ammonium molybdate. Mulch the soil in order not to keep it too compact, and for it to be kept moist. Cucumber seeds can only be sown once the soil has warmed up and reached 70 degrees Fahrenheit (21 degrees Celsius). This means that cucumbers are best planted during late spring, about three to four weeks after the last frost. Choose a sunny location when planting cucumbers. Turn the soil over to around six inches (15 cm) deep, and add some organic compost. Cucumber seeds can be grown indoors first and then be transplanted outside once the temperature is warm. Plant the seeds in peat pots after the last frost, when the seeds have sprouted they will be ready to be transplanted outdoors. Leave 15 inches (40 cm) between each seedling in order to give them ample space to grow. Always see to it that there is plenty of room for the cucumber plants to grow so that they can produce as many crops as possible. Space the rows 35 inches (100 cm) apart if planting more than a single row. 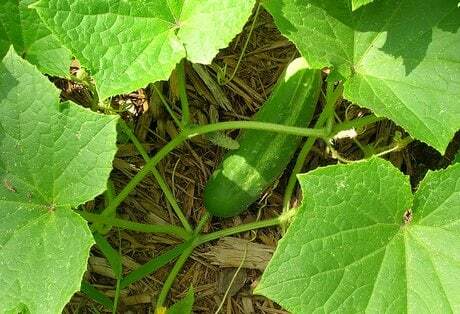 Weeds can grow fast beside cucumbers, so it is necessary to regularly weed the garden. When doing so be careful not to damage the root system as this will lead to significantly slowing of the growing cucumbers. In order for cucumbers to be juicy and firm, water them well every week; the cucumber is a fruit that is highly rich in water content. Cucumber plants have both female and male flowers; it is the female flowers that will give rise to the crops. Crops can be increased by aiding the pollination process. This can be done with the use of a cotton bud to transfer the male pollen to the center of the female flowers. The male flowers can be easily distinguished from the female ones as they don’t have a tiny cucumber at their base. Pests such as aphids, red spider mites and banded pumpkin beetles can cause problems to the leaves and flowers of cucumber. Downy and powdery mildew are some of the most common diseases for this plant. Cover the cucumber bed after planting with the use of cheesecloth to help the seedlings get established without being feasted on by the local insect community. Support the cheesecloth with a ground frame that is enclosed on the sides in order to keep the bugs out the plants. Remove the covering only when the plant has started to flower. Cucumbers can be harvested 50 to 60 days after sowing. The skin color of the fruit should be dark green in color. Yellow fruits are over ripe and have a poor quality of flavor. Twist the fruits off the plant or simply cut the stalk found above the tip of the cucumber. 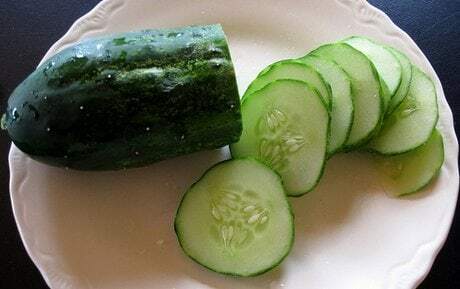 In order to have a higher yield of crop, it is important to pick cucumbers at a small size, picking fruits regulary can provide a long and productive harvest of cucumbers. Like other vegetables cucumbers are best eaten fresh. However, they can also be stored by pickling. Purdue Dept. 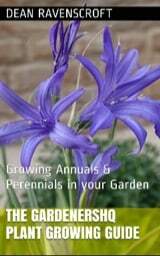 of Horticulture; Gardener’s World Harvest Cucumbers; Wikipedia; Ohio State University Extension; BBC Gardening Guide.